Geocentric model. This shows some aspects of geocentric models. (This is just for "historical interest"- it is utter nonsense.) The top panel shows an "epicycle" which is a small circle that a planet follows. The center of the epicycle follows a larger circle (the "deferent") around the Earth. Some models put the Earth not quite in the center of the circle. The bottom panel shows Ptolemaic (geocentric) system. Note that Mercury and Venus orbit points on a line between Earth and Sun. 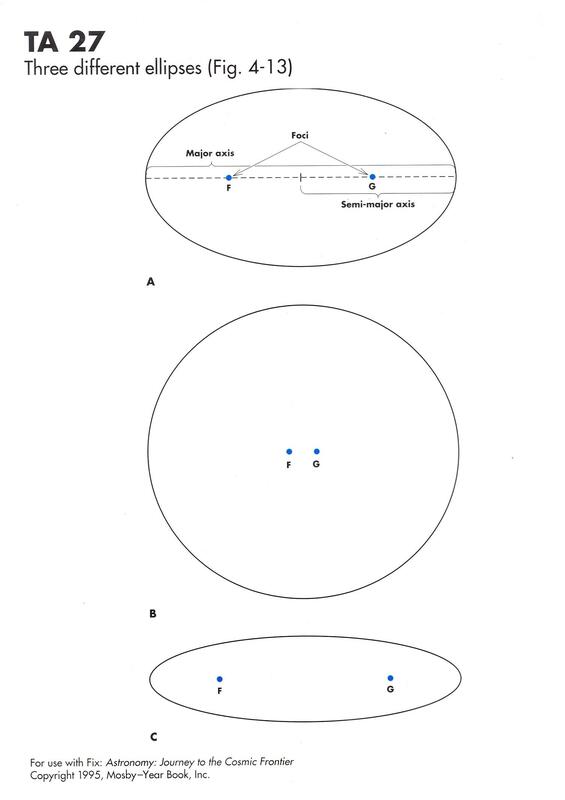 This is how the geocentric model sought to explain the fact that we only see Mercury and Venus within a limited angular distance from the Sun. 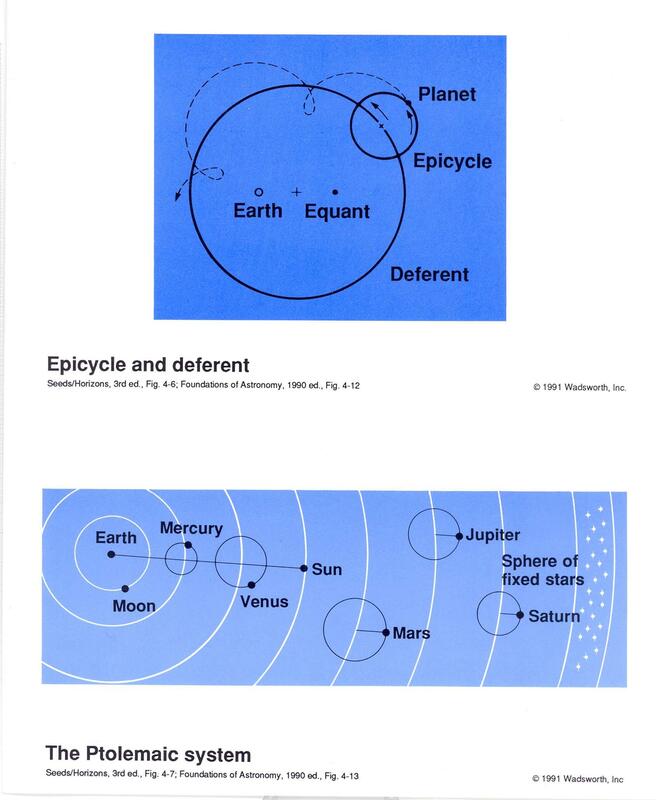 The other planets (Mars, Jupiter and Saturn) orbit on epicycles around deferents that are centered at (or near) the Earth. The epicycles and other bizarre "wheels on wheels" were attempts to keep the Earth in the center of the Solar System and keep the planets moving on circles, while explaining the observed retrograde loops of Mars, Jupiter, and Saturn. Mar's retrograde loops. 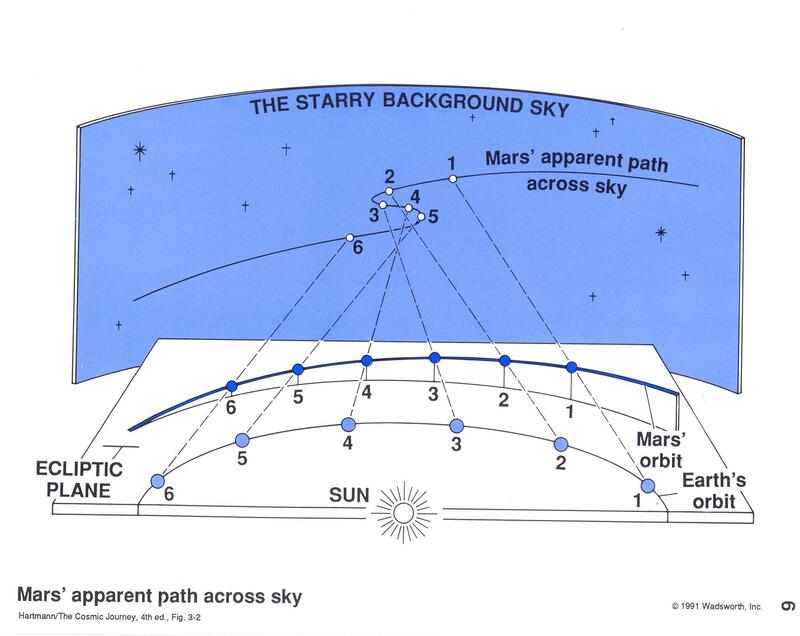 If you carefully noted the position of Mars relative to background stars over a period of a few months, you would find that Mars moves eastward relative to the stars, but sometimes it "backs up" and then turns around again. This motion is called a "retrograde loop". In the geocentric system, epicycles were used to try to explain retrograde loops. Retrograde loops in heliocentric model. Retrograde loops of Mars, Jupiter and Saturn are easily explainable in heliocentric model, occuring when we pass the outer planet as both Earth and the outer planet orbit Sun. Planets closer to the Sun orbit the Sun in a shorter time than planets farther from Sun. 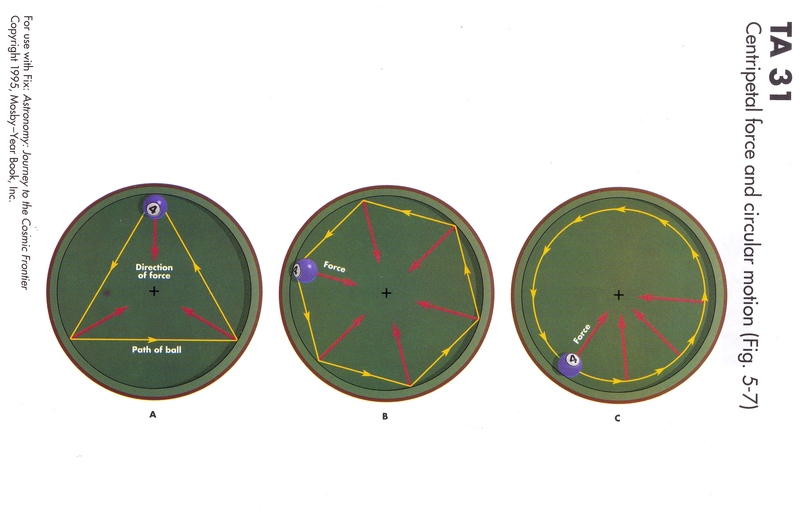 Definitions of some planetary configurations. Conjunction is when planet passes closest to Sun in sky- can be between Earth and Sun for inferior planet or on opposite side of Sun for superior planet. 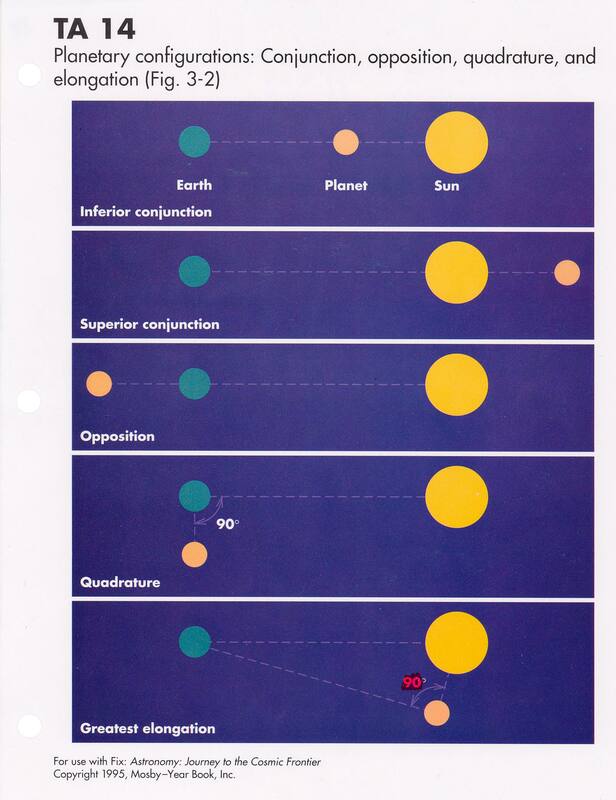 Opposition is when the planet is opposite the Sun in the sky- can only happen for a superior planet. (Full moon happens at oppostion of the Moon.) 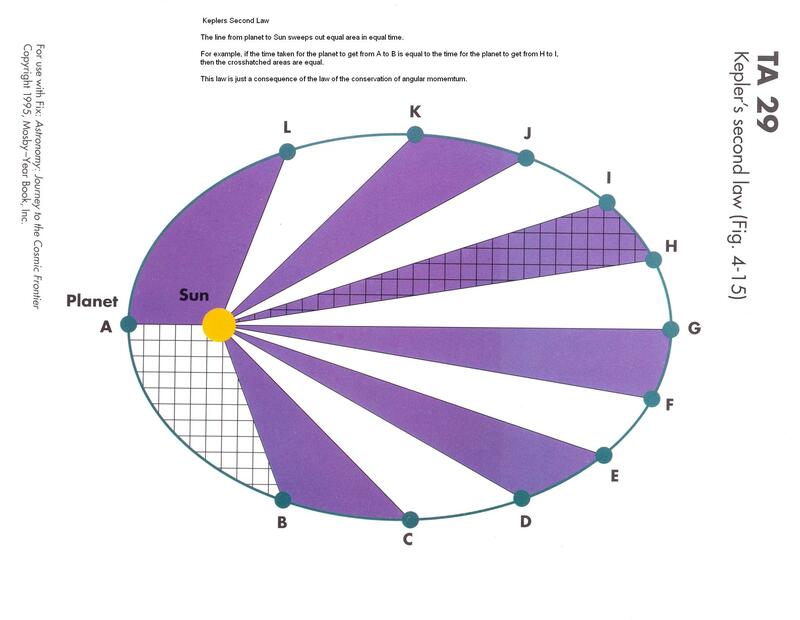 Quadrature is when the angle between Sun and planet, as seen from Earth, is 90 degrees. Can only happen for a superior planet. 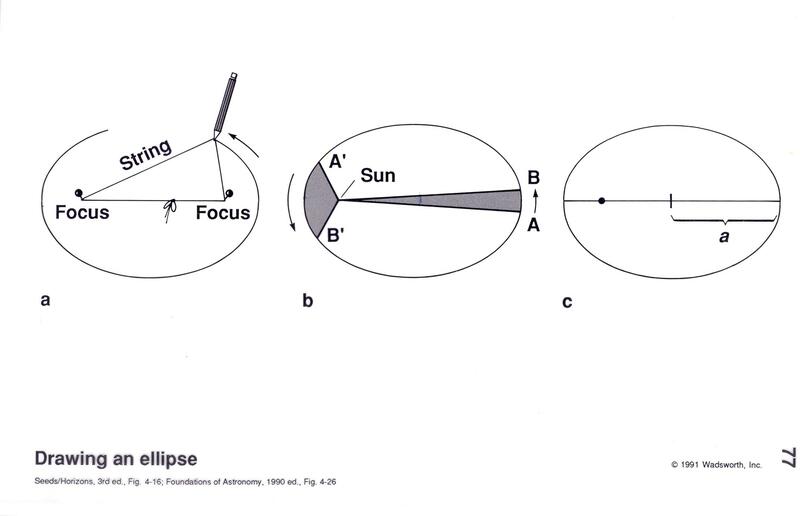 Greatest elongation for an inferior planet is when the planet and Sun are separated by the greatest angle as seen from Earth. Greatest elengation happens when the *Earth* is at quadrature, *as seen from the inferior planet*. 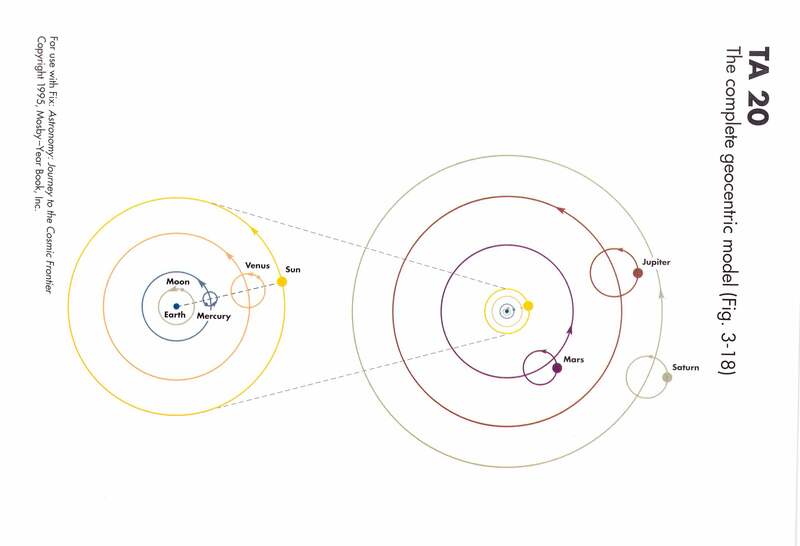 Kepler's Laws Using the extensive collection of planetary positions measured by Tycho Brahe over several decades, Kepler was able to distill these thousands of observations to 3 Laws of Planetary Motion. The first Law says that the orbits of planets around the Sun are ellipitcal in shape, NOT circular (or circle with epicycles and other such nonsense.) The second Law is shown graphically in the next viewgraph. This Law is just a statements of the conservation of angular momentum, but Kepler did not know about this concept. The third Law is a quantitative relationship between the orbital period (time for a body to orbit Sun once) and the size of the orbit of the body (expressed as the semimajor axis - a - of the orbit). Note that these Laws were expressed by Kepler around 400 years ago!! Kepler did not understand the physics behind his laws, but (somehow!) 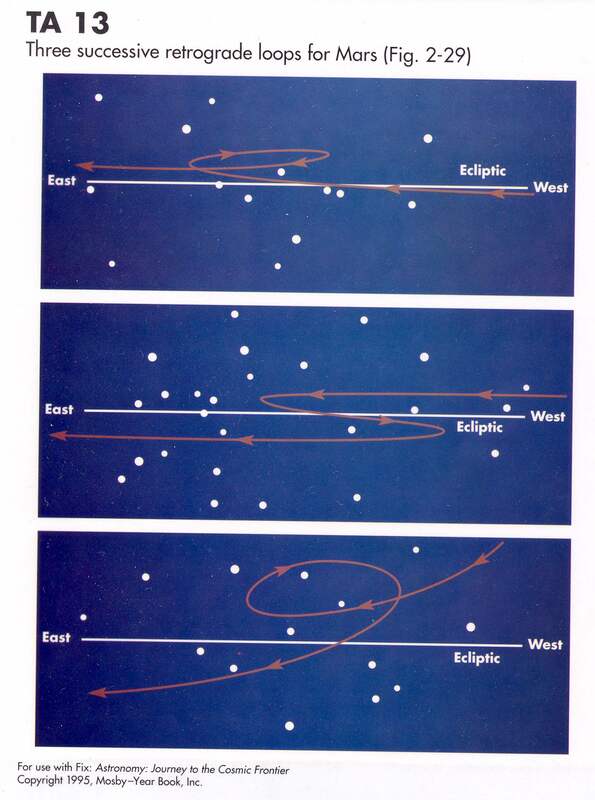 was able to see the simple basic patterns that could account for the observations of planetary positions. Of course, the planetary positions are measured from the Earth, which is also moving! Certainly this is one of the most stunning intellectual acheivements of mankind. 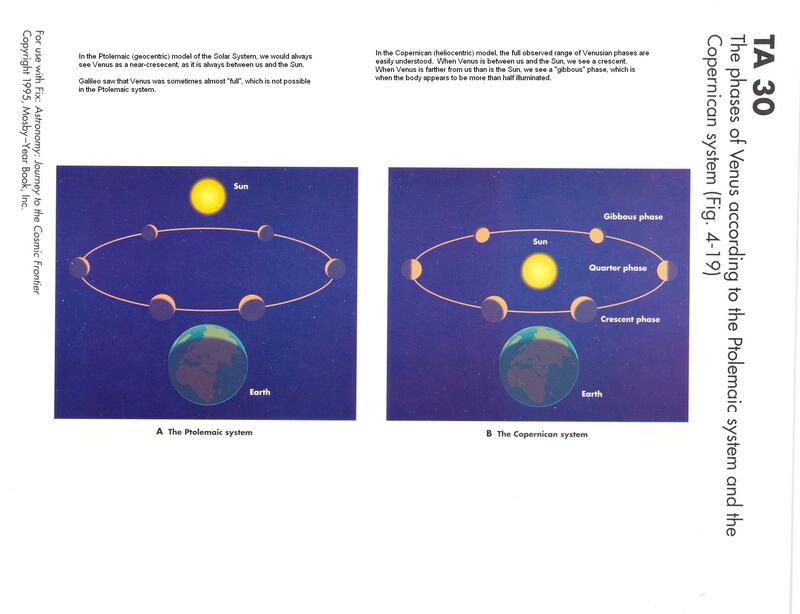 Phases of Venus in geocentric and heliocentric models.. In the geocentric model, Venus is always between Earth and Sun, so it is always seen as a near crescent, as we are seeing mostly the nightside of Venus at all times. In the heliocentric system, Venus goes through a complete range of phases, from thin crescent when it is near Earth to full when on other side of Sun from Earth. Moreover, the angular size of Venus is related to its phase in this model. The "crescent Venus" only occurs when Venus is close to us, and the "full" Venus only when Venus far from us. So Venus looks larger when a crecent than when it is full. Observed phases of Venus. These are what the planets look like through a small telescope when they are closest to Earth (and look biggest to us) and when they are farthest away and look smallest. Venus shows the largest change in size. Note that Venus appears much larger when a crescent than when near full. This is easy to understand in the heliocentric (Copernican) system but impossible to explain in the geocentric (e.g. Ptolemaic) system. Galileo was the first to see this, as it requires a telescope to see the different phases of Venus. 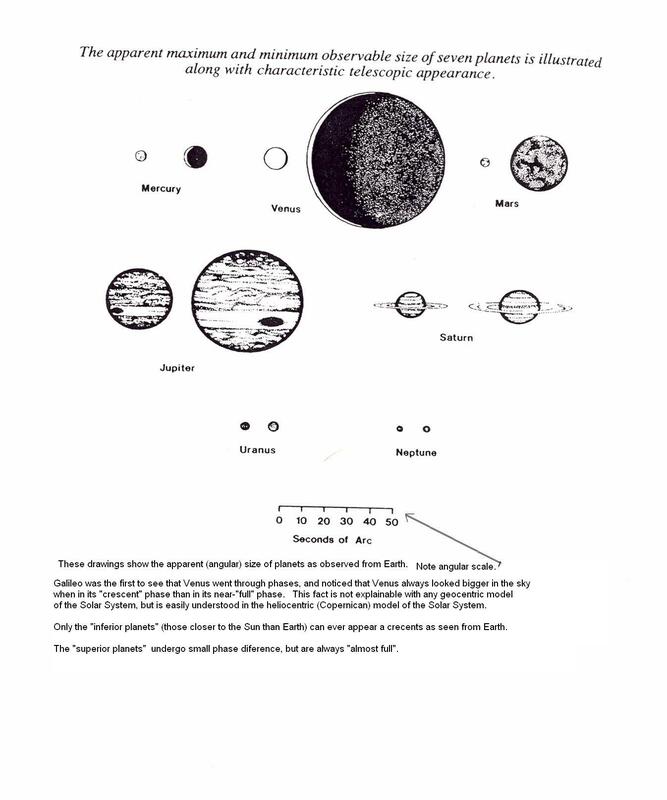 Note that Mars, Jupiter, and Saturn, the planets farther from Sun than Earth (the so called "superior planets") do not show much phase changes, while both Mercury and Venus, closer to the Sun than the earth (the so called "inferior planets") both go though phase changes from "full" to "crescent". Phases of Moon. This diagram is what you would see if you could look down on the Earth-Moon system. Note that half of the Moon and half of the Earth (the halves facing the Sun) are light colored (these parts of the bodies would be in sunlight, while the other halves are in darkness. You must "put yourself in the picture" and imagine what you would see STANDING ON THE EARTH. 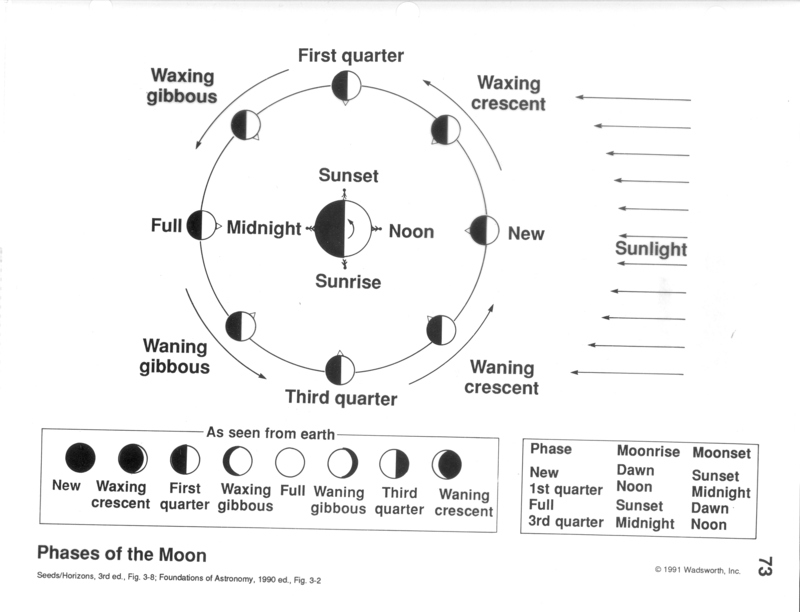 For example, if the Moon were on the left hand side of the diagram ("Full") then if you were standing on the Earth at the point labeled "sunset", what would you see? You would see the Sun off to the right, setting in the west as the Earth turned (couterclockwise as shown by arrow on Earth), and the Moon would be opposite the Sun, on the eastern horizon, rising as the Sun was setting. Phases in a room. You could demonstrate the idea behind the phases of the Moon in a room. Here the illumination is provided by a lamp off to the right. The Earth (position of observer) is the guy in the chair. The Moon is represented by the orange ball held by the woman. 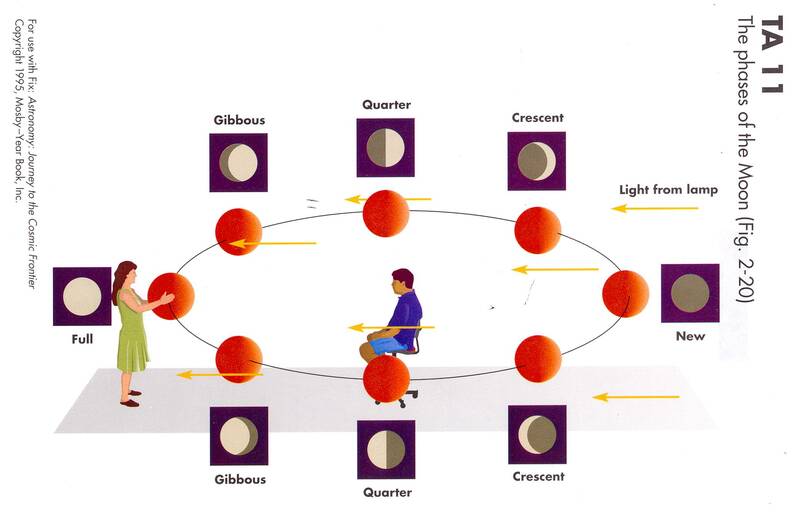 By moving the ball around the guy in the center, mimicing the motion of the Moon around the Earth, the ball would go through "phases". The important thing is the relative position between illumination, observer and ball. 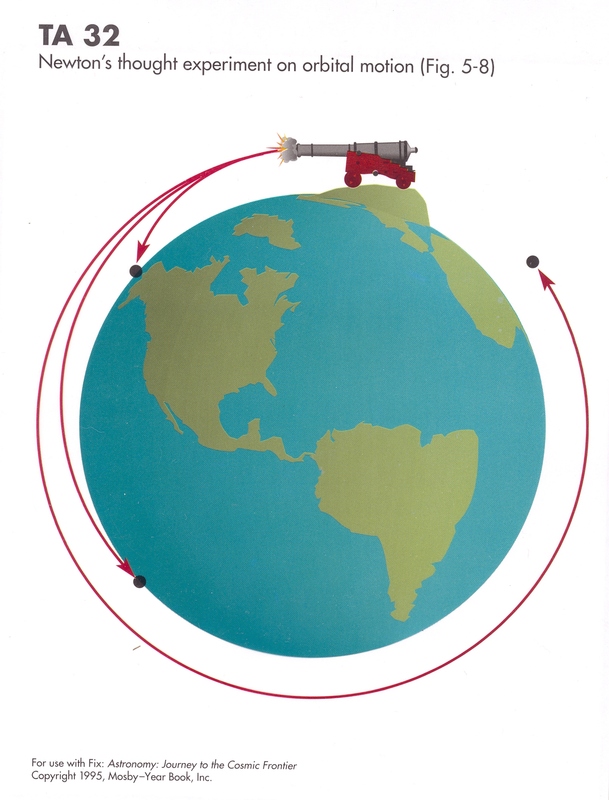 Once the object gets into orbit (put there by a rocket rather than a cannon! ), it does *NOT* require any further force (other than gravity) to keep it in its orbit. In fact, you need to exert a force on the object for the object to come back to the Earth. 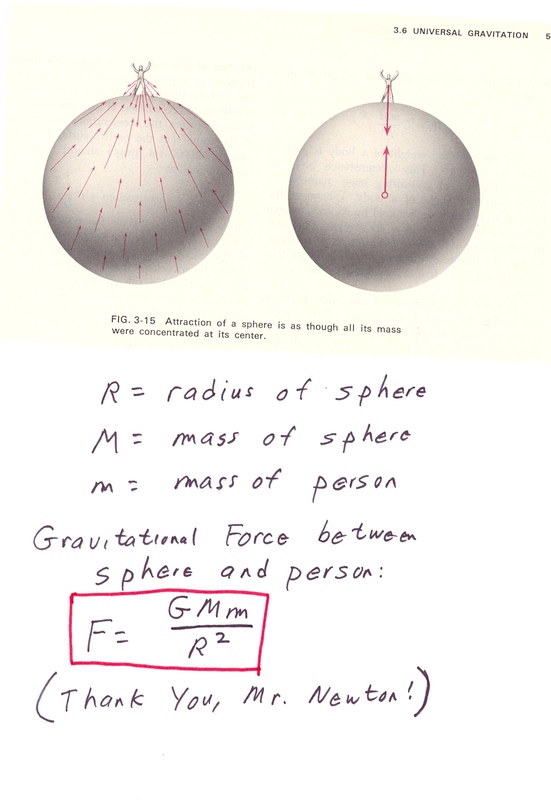 Assuming the orbiting object is above the Earth's atmosphere, so that there is negligible air resistance, the only force acting on the object is the gravitational force between the object and the Earth. This force always acts in the direction between the object and the center of the Earth- it is a centripetal force (see below). In simplest terms, the object is kept in an orbit by the constant pull of gravity acting as a "string" to keep the object in its circular path. 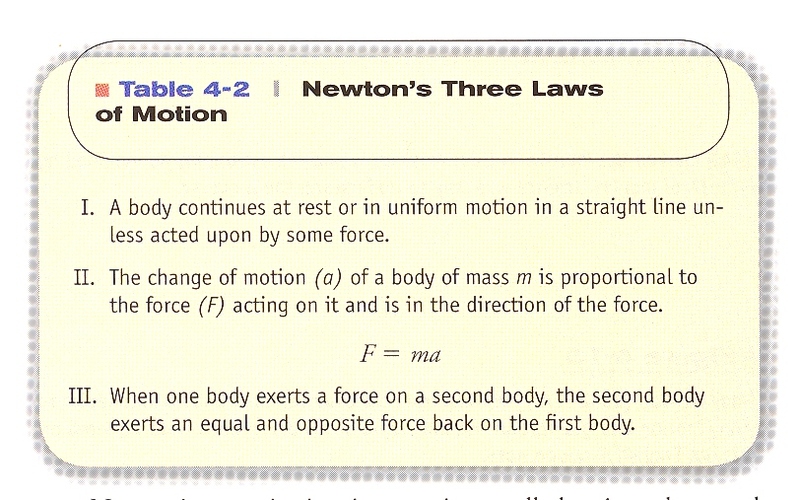 Newton's Laws of Motion. The staple of intro physics. We can understand how things move by considering forces - pushes or pulls- that move them. 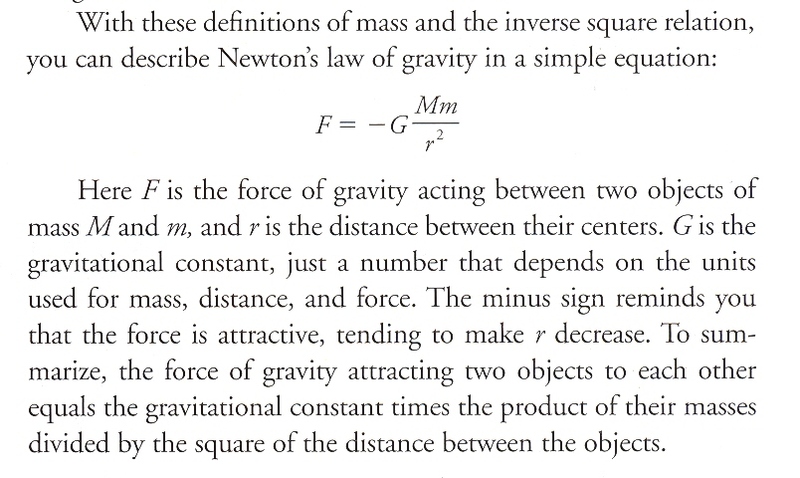 Newton's Law of Gravity. The most important force in understanding the motion of objects in the Solar System is the force of gravity. Centripetal force. If you want to make an object go in a circle, you have to keep pushing (or pulling) it towards the center of the circle. This force towards the center is called the centripetal (center seeking) force. In this example of a ball going around the inside of a circular pool table, the force would be provided by the lip of the table pushing the ball. Centripetal acceleration. This shows the derivation of the magnitude of the centripetal acceleration for an object moving in a circle. 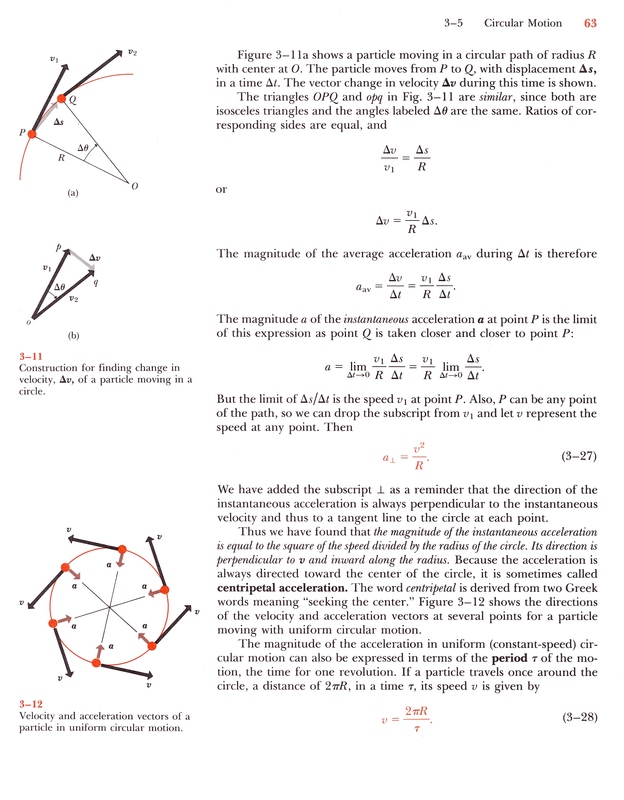 The direction of the acceleration is always directed towards the center of the circle (Fig 3-12). 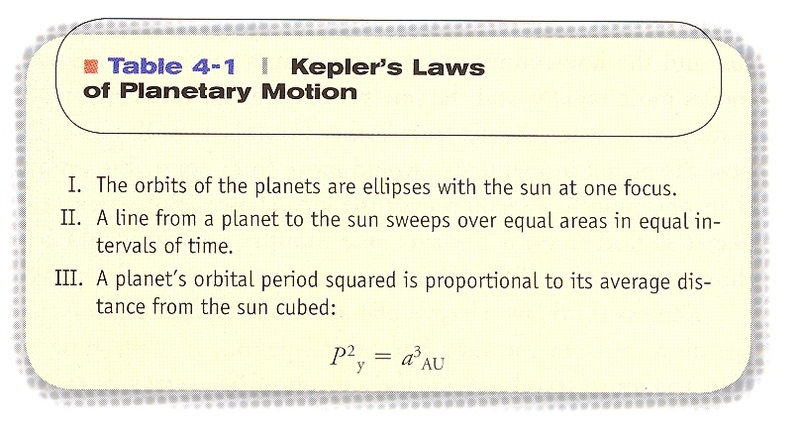 Of course, this form of the Law, unlike Kepler's original version, can apply to ANY massive body, not just the Sun. SO we can use this to find the period of the Space Shuttle orbiting the Earth, the period of a moon orbiting a planet, or the period of a planet orbiting another star. One must be careful to understand the meaning of radius (or semimajor axis). It is the distance between the centers of the bodies. So, for example, to calculate the period of the Shuttle around the Earth, the distance to use is not the height of the Shuttle above the Earth, but the sum of the Earth's radius and the Shuttle height.